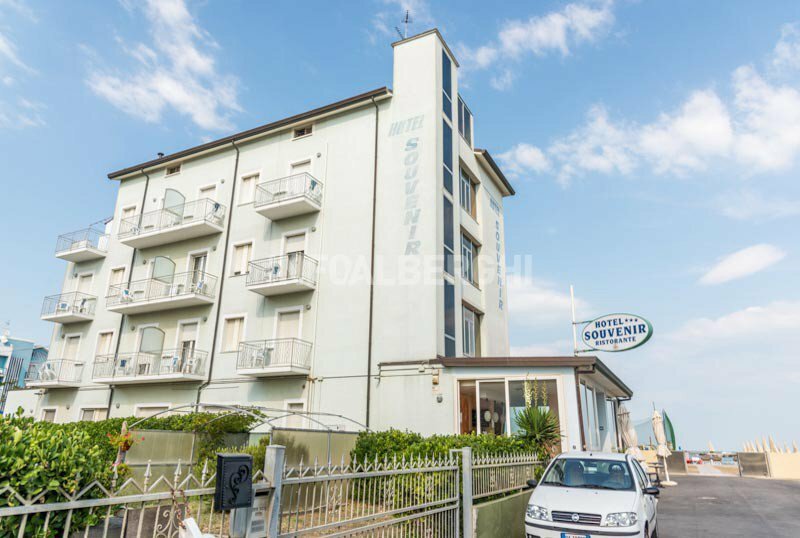 The 3-star Hotel Souvenir in Lido di Savio, facing the sea, is a modern, completely refurbished property with an à la carte restaurant on the beach. It offers private parking, rooms with sea view, private beach, WI-FI and disabled facilities. Admits small animals. The hotel is located in Lido di Savio directly on the sea, with direct access to the private beach. The location is convenient to reach the amusement park of Mirabilandia, the Park delta del Po, Ravenna and Milano Marittima. All rooms have beds with orthopedic slats, private bathroom with shower and hairdryer, direct dial telephone, satellite TV, safe, air conditioning, minibar, WI-FI and balcony with sea view. Superior rooms have a panoramic terrace with sea view, shower box and hydromassage, turkish bath, bathrobe, hairdryer, plasma sat TV, air conditioning and minibar. Open-air porch, terrace, free use of bicycles, private beach, bar, satellite TV room, reading room, à la carte restaurant, elevator, safe, newspapers, welcome drink, theme nights, free shuttle service to airport and train station. PARKING: covered and free, available for all guests. SERVICES FOR DISABLED: entrance on the ground floor with sloping ramp, lift for disabled people, rooms with wheelchair maneuver space, accessible shower. BREAKFAST: sweet and savory buffet, to be enjoyed in the room. LUNCH AND DINNER: local cuisine with 3 choices menu. The hotel offers a new restaurant directly on the shoreline, "Brasserie sul Mare", where you can taste the most delicious sea and land specialties. In case of excursion it is possible to request a packed lunch. Pasta and desserts are homemade. The hotel has a private beach, overlooking the hotel restaurant "Brasserie sul mare". The prices of the price list are per person per day in full board. FULL BOARD: Full board + Private parking + Beach service with sunbeds and umbrella.